My sister Laura got me a great birthday gift this year--a book called Super Vision: A New View of Nature. One of the best things about the book is that its inclusion of one of Spanish anatomist Santiago Ramón y Cajal's delicate and elegant drawings of the cells of the retina. His drawings look more like surrealistic seascapes or minimalist compositions than medical illustration. Find out more about him here and see more images of his work here. that looks fabulous. I added it to my wish list. There's a few more here. Damn. For the longest time I've wanted to find some early histology drawings but my occasional lame searches failed to find much. Do you know of anything?? Funny how there is so much more out there (drawings, online) in terms of micrography (in the broad sense) than the tissue stuff. Although, perhaps that's as much a result of staining techniques catching up with the optical equipment; and maybe illustration printing overtook the need for so much hand drawing too. Thanks. I hadn't seen this post and went searching on Cajal's name after seeing the Design Boom anatomical maps. 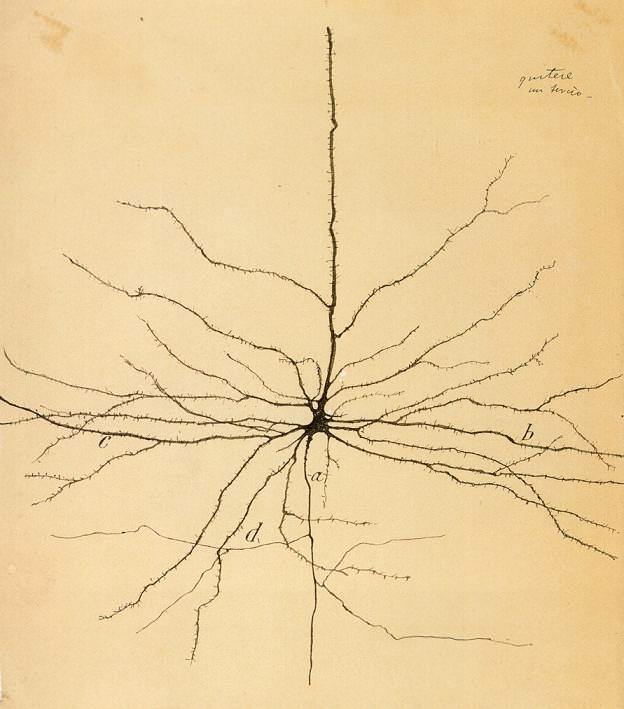 Ramon y Cajal was one of the founding fathers of neuroscience. A very smart fellow.